Two weeks ago, on a flight either from or to a conference in Kansas City, Trey was perusing the Sky Mall magazine and what did he find? 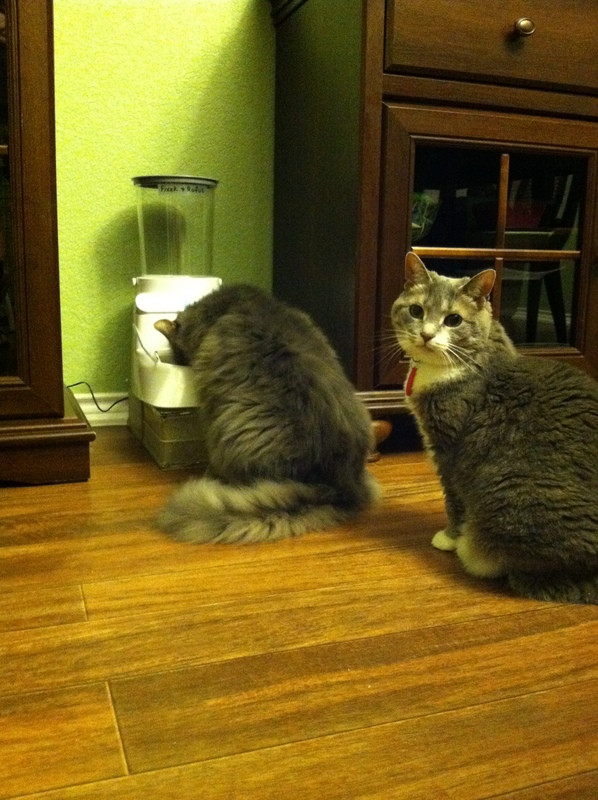 An Automatic Pet Feeder. But it wasn’t perfect…what it did do was shape his phrasing for a Google search that led us to the Auto Pet Feeder that is currently serving our felines four courses a day. I’m not gonna lie – it took a few days for them to get the hang of it. And it took me a few days to not worry about how much they hate (or genuinely seem to not notice) the collars they have to wear now so the RFID tags can open the doors to the feeders. But even as I type this, I can hear those mechanical doors opening to let Frank enjoy a mid-morning snack. This is going to be a HUGE help the next time we have to go out of town! And it’s pretty awesome not to get woken up by the wailing and gnashing of teeth that ensues when three very hungry kitties come to tell you it’s time for breakfast. omg… that is freaking AWESOME! i did not know that existed!